Finally finished for Telford this is my rendition of the TSR 2 as the BAC Eagle GR1 aircraft as used by 3 squadron. 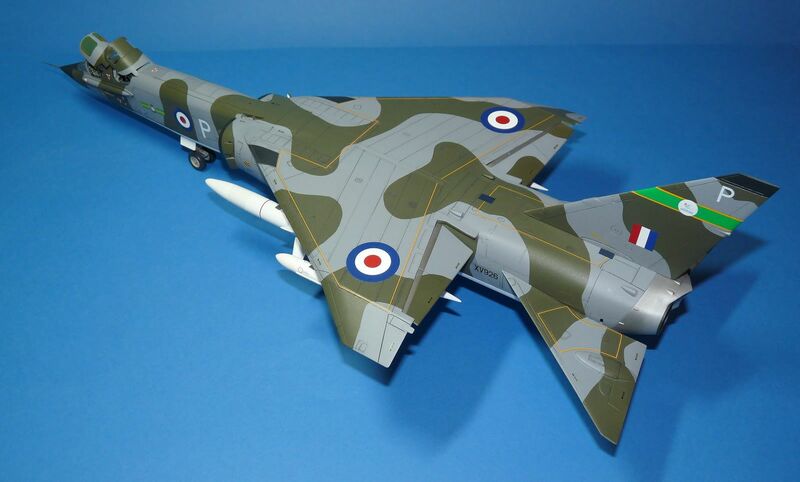 Those of you who have followed the build will recall that way back in the mists of time I decided to have a go at fixing the shape issues with the forward fuselage that to me totally ruined the look of the model and to be honest I was more than tempted to build the Dynavector vac as I wanted a more accurate model. I then sat down and with help from a few guys on the R and D sig decided to tackle the Airfix kit head on and hack the thing to bits to get the shape right from the off. It was a lot more work than I thought and involved a lot of head scratching and research but thanks to several folks including Damien Burke, Chris Gibson and Chris Tonks for his brilliant drawings the model slowly took form. The most difficult areas being the intakes and crazy oversized 'bulge' on the top of the mid section, as well as the shock cones and louvres along the topside. . Many resin and vac add ons were used here including Cammet, CMK and Model Alliance decals as well as good old Milliput and Evergreen Plasticard. 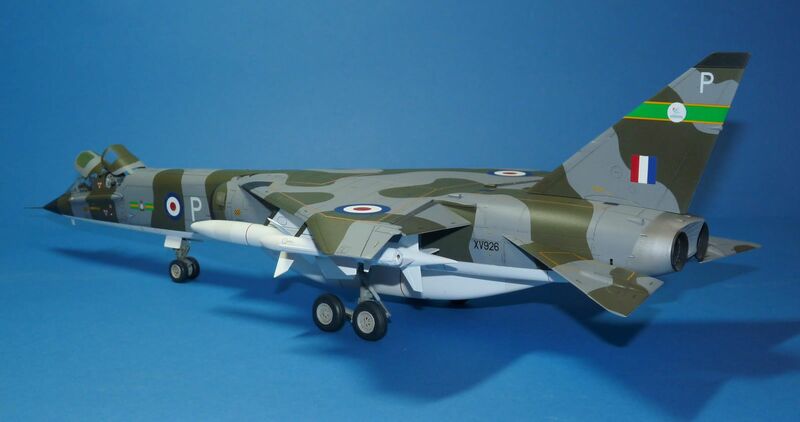 If anyones interested I've been asked by a certain manufacturer if I would make up some masters of the fuselage mods and produce them as a large conversion set for retail. 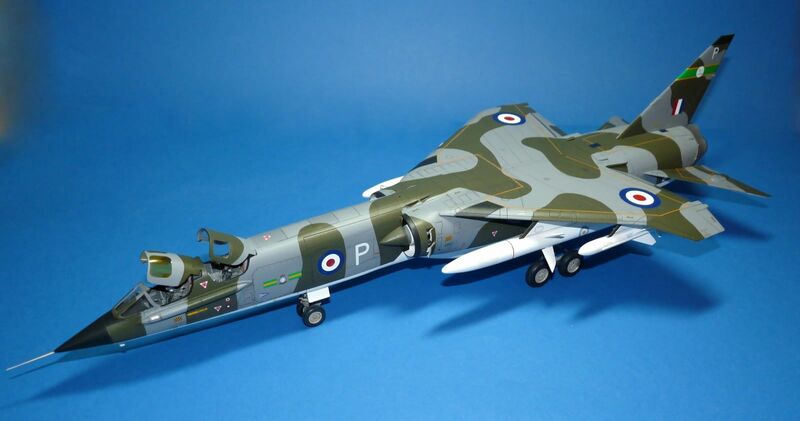 She's been finished in markings for XV926 of 3 squadron circa 1970 armed with Blue Water tactical nuclear missiles and a pair of Martel anti radiation weapons. Clearly, Field Marshal Haig is about to make yet another gargantuan effort to move his drinks cabinet six inches closer to Berlin. When I saw it on the table... I just 'knew' it was yours, Andy. Not too many folks may notice, but the slight tonal variations in the painting of the missiles is... (takes very deep breath)... a masterstroke. There I've said it !! (Thanks Ian...good luck mate 'down under and to the right a bit'! ). Beautiful work! Now where is that knitting smiley? The fact that you've put so much effort into making this an accurate whiff is one of the best repostes yet to critics of whiffery..
looks lovely, and realy was impressive at telford. as an aside any idea where i could get a pair of the blue waters? as they seem to have vanished in 1:48th. Fantastic quality build and defiantly worth all the pain you went through to produce it. Defiantly going to "borrow" a few ideas or possibly wait for the correction set to show up before I tackle my kit. Wow, It have the beauty of a "E type". Nice paint work, awesome scheme, ilove it.